Found this GINORMOUS pair of scissors while out junkin' today! "What is she planning to do with 2-foot long scissors?!" I think they'll look fabulous hanging in my studio. I'll be prepared to "cut the ribbon" at my grand opening! Ha, ha!! Thanks for making me smile, Sandy! Yours are very nice. 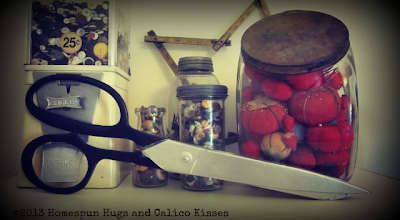 I have a pair of scissors which are quite longer, my Dad and Mom used them when they put up wallpaper (in the thirties). I guess they are called a "pair" because of two blades???? Wow, Peggy! I can't imagine actually using a pair of scissors that BIG! How nice that you still have them!